Yay! What a month it's been at the c&p HQ! We finally launched our 'Are We There Yet' S/S collection which featured our 'First Love' bustier (which sold out overnight) and our new 'Heart Breaker' bustier. We've also picked up some exciting new stockists in Auckland NZ and Manhattan in NY which are soon to be announced! We couldn't be happier with how fast our tiny little brand is growing and here's a little re-cap in photos from our Instagram channel! You can follow us here on @casperandpearl. It must be worth it; Rihanna is even following us and liking our photos! wow! I just discovered your gorgeous little brand and it's INSTANT AUTOMATIC LOVE! It's absolutely adorable. Thanks so much for the kind words and love! Gorgeous photos girls. Congratulations on all the new opportunities. Such pretty images. I so wish I lived in Australia so I could get my hands on your adorable little items! These photographs are lovely! The new collection looks gorgeous. Your blog is absolutely beautiful! I am in love with all your incredible posts. Your instagram photographs are beautiful! Beautiful images! Gals to meet another Oz blogger and I am from Auckland originally!!! Can't wait to hear and see more great news! Thanks on commenting on my blog post! Very pretty pictures. Especially loving that bustier! thanks so much for stopping by my blog and leaving a sweet comment! 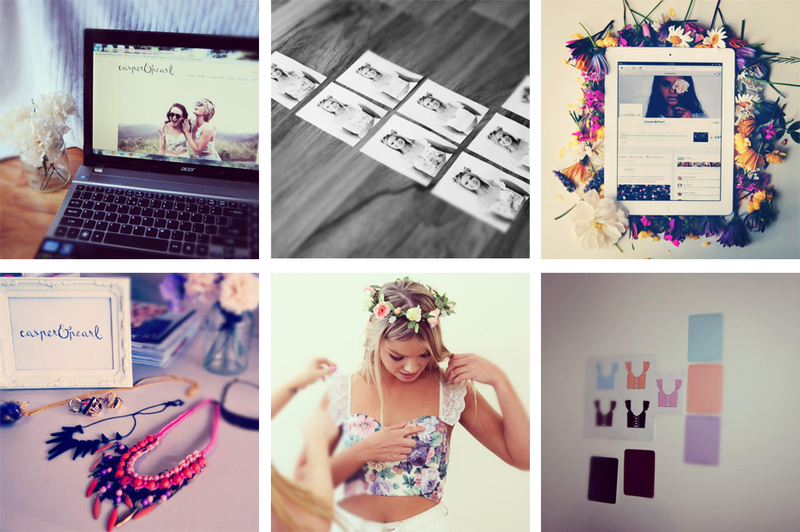 you girls have a gorgeous blog, gorgeous imagery, and gorgeous designs--so feminine! love it! CONGRATS on your launch & selling out your bustier! Amazing pics dear and gorgeous blog! Sounds like really exciting news, the clothes are beautiful and so feminine which is really hard to find these days! Hi! Thank you for the comment. Would you like to Follow each other? :) Kisses from vv! What a beautiful brand! I love that cropped top...I wish it wasn't turning fall/winter here! Lovely images! Totally love those necklaces.